These days, biologists, physicists and other scientists regularly use optical fibers to pipe light around inside their labs. 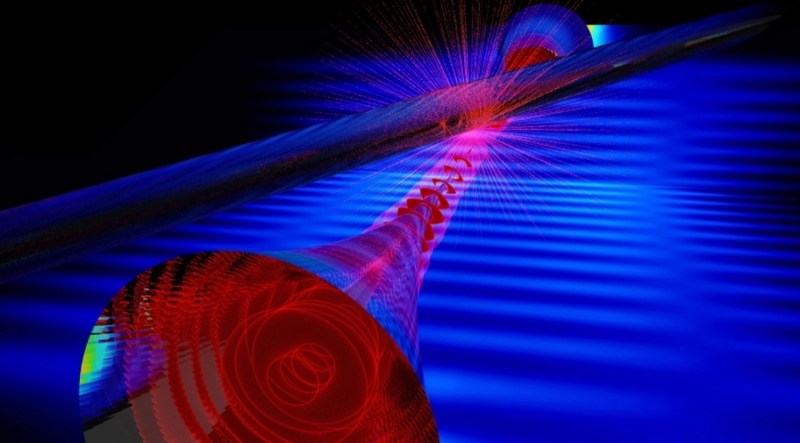 Recently, quantum research labs have been reshaping optical fibers and stretching them into tiny tapers. Light still makes its way from A to B through these nanometer-scale tapers, but some of it is forced to travel outside of the fiber. This exterior, or evanescent, light can capture atoms and then carry information about that light-matter interaction to a detector. Fine-tuning such evanescent light fields is tricky and requires tools for characterizing both the fiber and the light. To this end, researchers from JQI, the Army Research Laboratory (ARL), and the Naval Research Laboratory (NRL) have developed a novel method to measure how light propagates through a nanofiber, allowing them to determine its thickness to a precision less than the width of an atom. The technique, described in the January 20, 2017 issue of the journal Optica, is direct, fast and, unlike the standard imaging method, preserves the integrity of the fiber. As a result, the probe can be used in-situ with the nanofiber fabrication equipment, which will streamline implementation in quantum optics and quantum information experiments.